Financial Regulation Matters: Is Dublin Ready and Able to Take Advantage of a ‘Hard-Brexit’? Is Dublin Ready and Able to Take Advantage of a ‘Hard-Brexit’? Today’s post looks at the jostling for position currently taking place within Europe in anticipation of the U.K.’s and the E.U.’s negotiations over the U.K.’s secession deteriorating into what has been termed as a ‘hard-Brexit’ i.e. an almost total separation from the Union and the benefits that come with it. We have already discussed this jostling in Financial Regulation Matters through the lens of a battle between Paris and Frankfurt, but Dublin is emerging as a very credible alternative to those aspiring financial centres. However, there are consequences that come with being the host of such vast but socially-dangerous institutions, and Ireland’s recent history means that it is important to ask whether Ireland should be making itself as open as possible to these organisations. The debate about the jostling for position between Paris and Frankfurt is well covered in the financial press. Also, another issue that has been raised in the press is that the propagation of jobs from London, if the right deal is not struck during negotiations, is that there are different levels of jobs that will be moved – with Poland being cited as being likely to be the big winner when it comes to attracted mid-tier level banking jobs from the U.K. 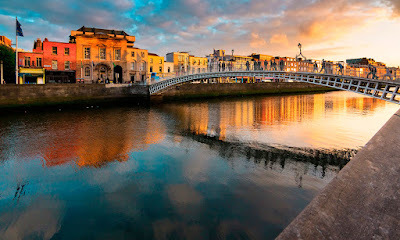 However, for this post the focus is on the potential for Dublin to become the main location for those fleeing London in order to continue their business with the E.U., and it is fair to say that Dublin is a real competitor for this potential influx. The obvious selling point of the city, to the employees of these large firms at least, is the issue of language, with experienced onlookers confirming that ‘the attractions [of Dublin] are that it is English-speaking, has flexible labour laws [and] the transportation links to the U.S. are pretty good’. Furthermore, the fact that Dublin is home to major subsidiaries like hosting the E.U. headquarters of Google, Facebook, Twitter, LinkedIn, and ‘more than half the world’s leading financial services firms’ means that it should already have the infrastructure, and also the culture, to accommodate the new arrivals. However, is this actually true? There are a number of ways of viewing certain elements of Dublin’s ‘package’, and not all are positive. The Republic’s Minister for Foreign Affairs and Trade recently discussed the post-Brexit issue, and described how the country has people in London drumming up support for Dublin’s ‘package’, with the campaign being most built upon the facts that a number of leading companies are already there, and that the low corporation taxes witnessed in Ireland would remain low. However, this issue of Corporation Tax reveals the first of a number of problems for Dublin’s ‘package’. Firstly, Ireland’s use of these tax rates and tax incentives resulted in the headline-generating €13 billion fine for Apple (which has yet to be resolved fully), which has potentially dented the confidence large corporations have in investing in Ireland. This perceived advantage over London may not even last, however, with Theresa May hinting that Corporation taxes would be slashed significantly in the event of a hard-Brexit. Secondly, there are doubts as to whether Ireland can even accommodate an influx of workers (estimated at 400,000 plus), because of a chronic shortage of residences, both residential and commercial; it has been suggested that there ‘just isn’t space’ enough to see the London skyline replicated in Dublin. Whilst residential rents may be cheaper in Dublin than in Paris, Frankfurt, or Luxembourg, the shortage of homes and commercial buildings in Dublin is particularly acute, and this would obviously be exacerbated with an influx of financial services workers looking for certain types of properties based upon a certain standard of living that they have been used to in London. However, these practical elements are overshadowed by a much larger issue. Ireland’s banking crisis, in the wake of the Financial Crisis, was particularly dangerous. As a result of ‘lighter-touch regulation’, the country was particularly exposed to the downturn emanating from New York, and would go on to pay a heavy price. After injecting billions upon billions of Euros into their banking system, Ireland would eventually accept a ‘bail-out-package from the EU and International Monetary Fund at a total of €85 billion. This massive loss, which is astounding when we consider the size of Ireland, resulted in the loss or more personal wealth per Irish citizen than in any other Eurozone country and the sharp increase of socially-important factors such as unemployment, poverty, and the impact upon psychological and physical health. These factors cannot be forgotten, particularly as it was only a decade ago that Ireland was plunged into a national crisis. However, the sentiment being displayed is paradoxical, in that there is a conscious effort to encourage any business from London, but also a declared belief that the country will not just accept any institution – this divergence hints at a naivety that may prove particularly costly. Ultimately, Dublin is a contender in an arena that is becoming particularly ruthless by the day (with Ireland officially complaining to the E.U. about the behaviour of its competitors). There are advantages to moving to Dublin that would appeal to big business, like the tax rates and sentiments displayed towards big business, and this is being demonstrated by recent news regarding a number of important expansions in the city. However, there are a number of disadvantages, which include a lack of a ‘financial ecosystem’ when compared to more established financial centres like Frankfurt, the issue regarding housing and hosting this proposed influx, and finally a shortage of ‘cachet’, which is vitally important in respect to courting the business of Middle-Eastern Sheiks or Russian Oligarchs, for example. But, it is contested here that there is a much bigger problem, and that is the capability of Ireland to protect itself from institutions that have the upper hand, just seven years on from having to accept an €85 billion bail-out. These financial institutions, rightly or wrongly, have seen their positions improve beyond recognition since the U.K. electorate made its decision in 2016, and the institutions know it. If they deem it necessary to move, which is certainly not guaranteed, then they will have their pick of locations that are competing with each other for their business – this imbalance of power puts the host location in grave danger, and that danger is, arguably, far too great for Ireland to consider. It is advisable to aim to host a proportion of the business that may leave London, but this sentiment that Dublin will want to host the majority of the major players leaving London is not, in reality, something that will happen. Nor should it happen, because the Irish people will see their positions irrevocably threatened, and it is for this reason, more than any other, that the fight for the business leaving London is a straight fight between Paris and Frankfurt – they, particularly Germany, are the only countries capable of hosting such dangerous entities if they decide to leave the U.K.